The Growth Retailer Award, the winner of which will be revealed at the on March 9, is representative of entrepreneurial retailers that are growing fast. Here, in alphabetical order, is the 10-strong shortlist. Boux Avenue’s UK sales have grown to reached the £35m milestone in the year to March 2015. Lingerie retailer Boux Avenue was established by retail entrepreneur and former Dragons’ Den star Theo Paphitis in 2011. As a relative newcomer, Boux Avenue has been able to build its store network relevant to the multichannel world. It has already established a credible nationwide presence with close to 30 stores, has launched 14 international franchise stores and has ambitious plans for further international expansion. Paphitis is highly experienced in the lingerie sector, having launched the La Senza chain in the UK in the 1990s before selling it on in 2006. The motivation behind the launch of Boux Avenue was that he perceived there to be a gap in the market for a mid-market retailer that put great emphasis on the shopping experience. Boux Avenue’s UK sales have grown to reach the £35m milestone in the year to March 2015. The clothing specialist was founded in 1952 but is a very modern retailer. While it still trades from a store in Tunbridge Wells, it has adapted to carve itself out a strong position in ecommerce and describes itself as “the world’s largest online store for designer childrenswear”. It reported sales of £41.4m in 2015. Childrensalon sells 270 brands ranging from well-known names such as Burberry and Gucci to smaller, emerging labels. The retailer has featured in successive years in the London Stock Exchange’s ’1,000 Companies to Inspire Britain’ report. The etailer is able to offer smaller retailers high exposure and relatively low shipping costs. Farfetch operates an online fashion website that acts as a portal to more than 400 independent boutiques and showcases more than 1,000 brands. It arranges collection from these boutiques and has them delivered to its customers. The company says it “brings together the world’s best independent boutiques, offering customers a vast selection of designer pieces curated by some of the most renowned, exciting and unique buyers in the fashion industry”. The etailer is able to offer smaller retailers high exposure and relatively low shipping costs, while at the same time providing its mainly affluent customer base with a deep range. Farfetch has also made a move into physical retailing through the acquisition of the London-based Browns boutique. This store is used as an ‘incubator lab’ to test new retail technologies. The etailer achieved turnover of £87.1m in 2015, but gross sales through the website amounted to just over £300m. Etailer Green Man Gaming is a videogames specialist launched in 2009 by founder and chief executive Paul Sulyok. His aim is “to challenge and revolutionise the consumer offer in a digital games retail space”. Green Man Gaming works with more than 500 publishers, developers and distributors of games in 190 countries, and has created an online community that connects gamers and rewards them for their involvement. Green Man Gaming is currently tracking 200,000,000 gamers, which Sulyok told last year’s Retail Week Buzz conference allows the business to treat its customers as individuals. Its overall sales stood at £29.6m in 2015. Making furniture buying as simple and convenient as possible is at the heart of the Loaf strategy. Loaf is a fast-growing online furniture retailer. Its mission is to make the buying and delivery process as simple and hassle-free as possible for its customers. Founded by Charlie Marshall in 2008, the retailer originally sold a limited range of beds. But the offer has been widened and now covers furniture and accessories for the whole house. Making furniture buying as simple and convenient as possible is at the heart of the Loaf strategy. Its proposition is based on the relationship between commerce and content. Loaf is now having a massive push on full multichannel development and is driving ahead with the development of a series of Loaf Shacks – relaxed retail destinations where customers have the opportunity to “loaf around” on the products and try them out at first hand. Marshall, who still heads up the business, said “Loaf’s move to bricks and clicks is all about reaffirming our brand and giving customers a fantastic experience”. Retail sales stood at £26.9m in 2015/16 and Loaf aims to hit the £100m mark in the next few years. Made completed a £38m funding round in July 2015 which is helping to accelerate its expansion plans. Made.com is an online furniture retailer that offers designer furniture at more affordable prices. Costs are kept low by grouping together all orders once a week and sourcing directly from overseas factories. Its mission is to become Europe’s number-one online destination for home design and make great design accessible to everyone. Made.com has set itself apart from other furniture retailers through the merging of commerce and content on its website. It also hosts Unboxed – an online forum where customers share photos of their furniture. Made.com has expanded internationally into France, Italy, the Netherlands and, most recently, Germany and Belgium. In 2015, overseas sales accounted for approximately 30% of its overall turnover of £61.6m. The etailer completed a £38m funding round in July 2015, which is helping to accelerate its expansion plans. Matchesfashion.com is a luxury fashion retailer offering more than 450 designer labels. Founded by Ruth and Tom Chapman as Matches in 1987, the business has transitioned from a bricks-and-mortar operation into a multichannel player that now generates 84% of its sales online. It currently trades through four Matchesfashion stores and also operates seven franchise stores for the Max Mara and Diane von Furstenberg brands. Matchesfashion’s ultimate aim is to make the physical more digital and the digital more physical. To that end it has invested in store technology such as tablets that provide access to the full online range and mobile points of sale. Online customers also have access to a team of online stylists that are available 24/7. Ruth and Tom Chapman stepped down from the day-to-day running of the business to become joint chairmen in July 2015, when Ulric Jerome – the founder of electricals site Pixmania – took over as chief executive. Matchesfashion’s sales stood at £126.9m in the year to January 2016. Founded by Nitin Passi in 2009, Missguided sales reached £117.2m in 2015/16 and it now delivers to 160 countries. Missguided is a rapidly growing fast-fashion etailer targeting the 16- to 34-year-old female market with a range of celebrity-inspired, affordable clothing. The etailer describes itself not as fast fashion, but a “rapid fashion specialist that celebrates everything it means to be a girl in a digitally immersed world today”. Founded by Nitin Passi in 2009, sales reached £117.2m in 2015/16 and it now delivers to 160 countries. It has also dipped its toes into physical retailing through concessions in department stores and opened a first standalone store in the Westfield Stratford City shopping centre in November 2016. Speed to market and value for money are at the heart of Missguided’s offer. The retailer says on its website that it has “thousands of styles live at one time and fresh new threads hitting down every single day”. Typically there are 250 new catwalk-inspired items per week. Passi said in an interview in May 2015 that he believes Missguided can generate turnover of £1bn within five years. Notonthehighstreet is a curated online marketplace focusing on handcrafted and unique gifts that has undergone a period of rapid growth since it was founded in 2006. As part of a three-year plan outlined in 2014, Notonthehighstreet is seeking to widen the appeal of the site beyond its core audience of females and to become more gender-neutral. It hopes to achieve that by increasing the number of male sellers on its site as well as by raising brand awareness among men through its marketing. Notonthehighstreet is also in the process of diversifying its offer into the wider lifestyle market as it looks to reduce the seasonality of the business. The business reported sales of £38.7m in the year to March 2016, while gross sales through its website amounted to £158.6m. Oak Furniture Land launched a US site – Oakfurnitureland.com – in summer 2016, which is reported to have shown a “healthy growth” in sales. Hardwood specialist Oak Furniture Land was founded by Jason Bannister in 2004. It originally started out by selling on eBay, but by 2006 established its own ecommerce sites and made a move into physical showrooms in 2010. It has since undergone a rapid store-opening programme and was trading through 71 outlets at the end of its last financial year, during which it notched up sales of just under £240m. Offering low prices is an important part of Oak Furniture Land’s proposition, and in order to do this it contains costs across all stages of the supply chain. This has been helped by a degree of vertical integration, which includes the use of an in-house delivery service. The retailer is now also active internationally. It launched a US site – Oakfurnitureland.com – in summer 2016, which is reported to have shown a “healthy growth” in sales. 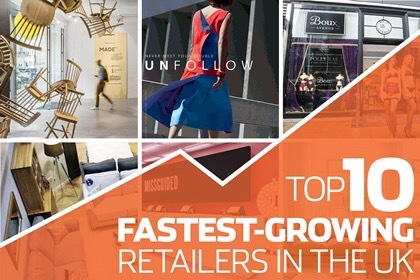 The growth retailer award, a non-entered category, is based on a ranking of retailers with the fastest-growing sales. The shortlist is drawn from retailers that had sales of at least £25m in their latest available accounts. They must be privately owned and registered in the UK. Calculations are based on the latest available accounts for each retailer as of December 2016. Posted on January 18, 2017, in Other. Bookmark the permalink. Leave a comment.